Our range of products include u tube manometer ( acrylic body ), u tube manometer ( metallic body ), absolute pressure manometer, u tube manometer, manometer and vacuum manometer. We are engaged in offering our clients with U Tube Manometers (Acrylic Body) that are available in various models with different specifications to fulfill their needs. All our products are widely acclaimed for their longer functional life, corrosion & abrasion resistance, dimensional accuracy and sturdy construction. Furthermore, our team of quality controllers checks each product on various parameters to ensure flawlessness. We are instrumental in offering our clients with U Tube Manometers (Metallic Body) that are available in 'U' tube type at industry leading prices. Our products are widely used in labs and industries for precision measurement of pressure, vacuum, differential pressure and flow measurement. Moreover, these are available in various sizes, designs, shapes and models to fulfill the diverse needs of our clients. We are leading manufacturer of absolute pressure manometer. we are leading manufacturer of inclined manometer. we are leading manufacturers of manometer. we are leading manufacturer of manometer. 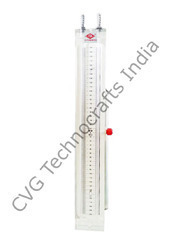 we are leading manufacturer of vaccume manometer.